Forget health impacts, tiny particles floating in the air are altering regional climates and affecting monsoon patterns and agricultural yield. These particles could be emanating from diesel and industrial emissions, biomass burning for cooking, forest fires and even dust. As scientists probe the complex science of aerosols, the larger picture of these tiny particles is just beginning to emerge. A P Mitra couldn't believe it. He along with 200-odd scientists from India, Europe, Maldives and the us was conducting an intensive six-week field experiment in 1999 to study the effect of airborne tiny particles called aerosols on climate. The tropical Indian Ocean, where clean air from the southern Indian Ocean including Antarctica and not-so-clean air from the Indian subcontinent meet, provided a unique natural laboratory for this experiment that involved the use of ships, aircrafts, balloons and satellites. As the results started pouring in, the scientists were in for a shock. A thick extensive haze layer roughly seven times the size of India had enveloped the northern Indian Ocean. "The haze extends to over 10 million square kilometres (km)," says Mitra of the Delhi-based National Physical Laboratory and one of the three co-chief scientists of the Indian Ocean Experiment (indoex). The Centre for Clouds, Chemistry and Climate at Scripps Institute of Oceanography, University of California, San Diego, coordinated the us $25 million project, 60 per cent of whose funding came from us agencies including the National Aeronautics and Space Administration (nasa). Seen 1,600 km off the coast, the haze extends from the ocean surface to altitudes of one to three km. Most of the northern Indian Ocean, including the Arabian Sea, much of the Bay of Bengal, and the equatorial Indian Ocean to about 5 south of the equator remains shrouded by the haze throughout the experiment. The Northeast monsoon -- the winter -- transports the haze thousands of miles to the Indian Ocean. Such high concentrations of pollutants less than a few micrometre in diameter were not seen earlier in these regions. Nor was its effect on rainfall known. "The haze could have a serious effect on rainfall and the onset of monsoon through its influence on cloud formation," says Mitra. And for a country like India, aerosols could very well be playing a critical role on the onset of monsoons over different regions. "Western and north-western India is becoming drier while eastern and southern India is becoming wetter," adds Mitra. It doesn't just stop there. From affecting agricultural yield to causing asthma, the frightful effects of aerosols are only now beginning to surface. Aerosols are particles about a millionth of a centimetre in diameter, consisting of sulphates, soot, organic carbon, and mineral dust and are produced both naturally and by human activities. Commonly known as 'suspended matter', aerosols are best described as tiny liquid or solid particles floating in the air. About 90 per cent of airborne aerosols are naturally occurring substances like dust and particulate matter from volcanic eruptions, and sea spray. Overall, humans are responsible for roughly 10 per cent of the aerosols, mainly as exhausts from automobile, industrial, and biomass burning. In the Indian Ocean study, however, scientists inferred that as much as 85 per cent of the aerosols were of "anthropogenic origin". Aerosol sources are of two types -- primary and secondary. Primary aerosols are emitted directly as tiny particles, such as smoke from bush or forest fires, soot from burning fossil fuels in industries, vehicles, trains, airplanes, airborne dust and sea-salt particles produced when sea spray dries out. Secondary aerosols are produced from gaseous precursors. Chemical reactions in the air, converts the primary gaseous pollutants -- like sulphur dioxide and nitrous oxide -- into gases with lower volatility, some of which condense into particulates. Sulphur dioxide pollution from power plants or other industries, converts into sulphate particles, for instance. Emissions from vegetation and marine organisms also form secondary aerosols in the atmosphere. The resulting product then nucleates to form new particles or condenses on pre-existing particles (see box: Aerosol triggers). These tiny particles can range in size from 0.01 micrometre to several tens of micrometre. For example, particles in cigarette smoke are in the middle range and typical cloud drops are 10 or more micrometre in diameter. Under normal circumstances, the majority of aerosols form a thin haze in the lower atmosphere where they are washed out by rain within about a week. A severe volcanic eruption on the other hand can put large amounts of aerosol into the upper atmosphere. Since it does not rain there, they can remain in the same place for many months, creating beautiful sunsets, and possibly causing summer temperatures to be cooler than normal by blocking out sunlight. Scientists estimate that in 1991, Mount Pinatubo in the Philippines injected about 20 million tonnes of sulphur dioxide into the atmosphere, cooling average global temperatures over the following year by about half a degree. But aerosols do not always have a cooling influence. Emerging evidence supports the case for aerosols also having a warming effect. It is this push and pull impact of aerosols that befuddles climate science. Fine aerosol particles of both primary and secondary origins can affect human health, reduce visibility and influence climate both directly and indirectly. Since aerosols reduce the amount of sunlight reaching the Earth's surface, they could have an adverse impact on agriculture and water resources. Moreover, settling of aerosol particles like black carbon and dust on plants can shield leaves from sunlight. Such a deposition can also increase acidity and affect plants. Children and elderly people inhaling the polluted air replete with these aerosols are at a greater risk of developing respiratory diseases. indoex began in 1996 and was conducted over four years during the winter season. In winter, before the Indian summer monsoon, the surface wind flows in the northeast direction over the Indian subcontinent and the surrounding region. These winds help in transporting a number of suspended particles from the continent to the ocean surface. The polluted northeast winds cover almost the entire region lying north of what is known as the Inter Tropical Convergence Zone (itcz). Bound by the landmasses of Arabia, Africa in the west and the Southeast Asian regions, Myanmar, Thailand, Malaysia in the east, itcz is an area of low pressure situated near the equator where northeast winds meet southeast winds. At the same time, on the south of itcz, the air is relatively pristine and almost uninfluenced by continents. The indoex project found that the quantity of particulate matter found hundreds of kilometres away from the source over the Indian Ocean was comparable to suburban air pollution in North America and Europe. Chemical analysis of the haze has revealed that as much as 85 per cent of the giant haze layer was due to human made aerosols with anthropogenic sources like fossil fuel burning, industrial emissions and biomass burning. 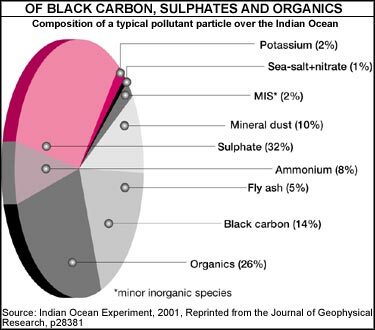 The composition of particulate matter was quite uniform over the northern Indian Ocean. A typical pollutant particle originating from an anthropogenic source consisted of 10-15 per cent of black carbon, 26 per cent of organic, 32 per cent of sulphate, 10 per cent of mineral dust, five per cent of fly ash and smaller fractions of other chemicals. Black carbon and fly ash are human produced, and sulphate can also be attributed to anthropogenic sources to a large extent. Black carbon particles were always mixed with organic compounds and sulphates (see graph: Of black carbon...) . Further evidence of the extent of pollution came from measuring aerosol optical depth (aod) values for the northern and southern Indian Ocean. aod is the approximate number of aerosols in a vertical path through the atmosphere relative to the standard number of aerosols in a similar path through a clean, dry atmosphere at sea level. Measurements taken by the Indian vessel Sagar Kanya during January to March from 1996 to 1999 showed that aod varies from about 0.05 (typical of unpolluted air) in the southern Indian Ocean to between 0.4 and 0.7 (very polluted) north of the equator over the Arabian Sea and the Bay of Bengal (see graph: Crowded region). The haze also disturbs the self-cleaning efficiency of the atmosphere by reducing the amount of hydroxyl radical (oh), a major oxidising chemical in the lower atmosphere. Most gases and air pollutants emitted into the atmosphere by human activities and natural processes and involved in ozone depletion or global warming are removed by reacting with oh. The black carbon content of the haze was high, making it highly absorbant of sunlight. Depending on the type and composition of particulates, they scatter or absorb solar energy in the atmosphere. Sulphates and nitrates are known to scatter sunlight back into the space, thus reducing the amount of energy absorbed by the Earth and cooling it. Black carbon or soot particles heat the atmosphere by absorbing solar energy due to their darker colour and hence warming the surrounding air. Observations and results from indoex are being fed into various climate models to study the impact of the vast stretch of pollution over the Indian Ocean on temperature, rainfall and hydrological cycle. The models are general circulation models (gcm) with fixed ocean temperature (gcm-fo), mixed layer ocean (gcm-mo) and fully coupled ocean model (gcm-co). The results are indicative of a much larger phenomena over the Indian Ocean and its wind circulatory systems, say scientists.